By David Vagi, Director of NGC Ancients…. 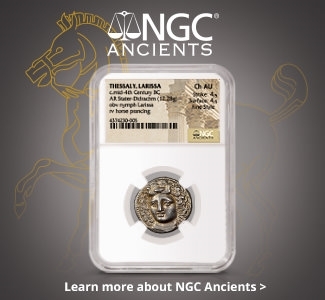 NGC offers premium access to an incomparable online resource that allows you to search through ancient coin auction prices realized and upcoming auctions from more than 80 auction firms. Ancient coins have come a long way in the last 20 years. A large number of scholarly books have been published, as well as some excellent works aimed squarely at the collector. We may add to these books some equally amazing tools on the Internet, which have made this field more accessible and collector-friendly than ever before. Silver obol of the Greek tyrant, Alexander of Pherae. Identifying this small silver obol of the Greek tyrant Alexander of Pherae would have been far more difficult 10 years ago than today, thanks primarily to online resources such as CoinArchives. 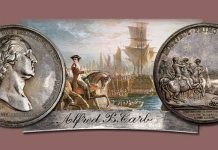 There was a time – not so long ago – when acquiring an ancient coin meant attending an auction or a show in person, or participating in an auction by mail bid. One could also buy coins from fixed-price lists that dealers so laboriously produced, printed and sent to their customers. Those days are fast being replaced by an online experience in which ancient coins usually are acquired through electronic bidding in auctions and from fixed price listings on websites. 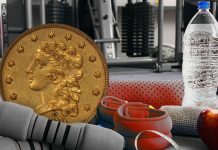 Just as the business has changed with the widespread use (indeed – reliance) on the Internet, so has the way that ancient coins are researched, both for experts and for those who are new to this branch of numismatics. 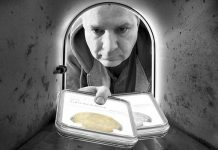 Internet resources have significantly leveled the playing field for the basic identification of coins, yet it has done little to impact the nature of top-level expertise. Even today, the only way to learn the most advanced aspects of ancient coinage is to physically handle and study tens of thousands of coins. Unfortunately, no amount of web-surfing can close that gap. Identifying a ‘mystery ancient’ in the pre-Internet age was a daunting task. Short of asking someone who knew, there was no way around it: an excellent ancient coin library was necessary. Today, that same work often can be performed via the Internet by a relative novice, without the aid of a single book. It is only the most advanced aspects of research and identification that still require a large, specialized library. At NGC, for example, we could not conduct our work without our substantial library. The same may be said for the top-level auction houses and dealers, who use their specialized references on a daily basis. 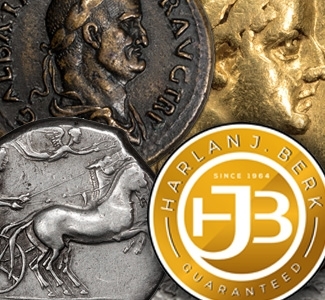 The best tool for those interested in researching ancient coins is CoinArchives, a comprehensive database of most every ancient coin sold at public auction in Europe and the United States for more than the last decade. 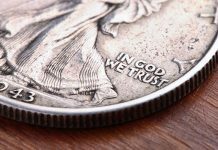 Not only is it useful for researching values and making comparative judgments of quality, but it is also incredibly helpful for identification – even if you’ve never seen the coin before, and don’t have a clue where to start. 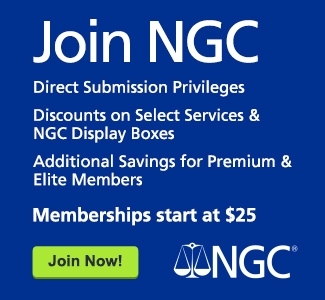 To logon to CoinArchives, go to NGC’s website at http://www.ngccoin.com. Click on the NGC Research tab. In the drop-down menu, click on Auctions. Click on CoinArchives – Ancients. Once there, type into the search window some basic, descriptive information. Let’s take an example. With the coin illustrated below, we might type in the words “horse” and “dolphin” (the quotation marks aren’t necessary, though for certain kinds of searches they are helpful). Probably the first coin in the search result will be a silver didrachm (‘nomos’) of the Greek city of Taras (Tarentum) in the region of Calabria in South Italy. In this case, the coin was issued late in the 4th Century BCE. Finding your exact variety within this large and complex series of coins may require a more specialized search. With the coin illustrated below we might type in the words “club” and “wreath”. 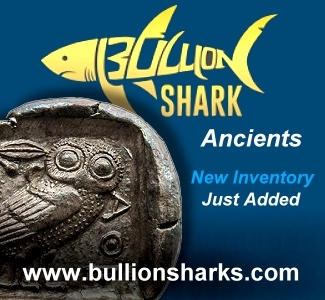 A lot of ancient coins have clubs and wreaths, so yours may not be the first listing to pop up. However, soon enough you’ll find a match: a silver tetradrachm of Macedon struck under Roman Rule, circa 167 to 148 BCE. Let’s try another. For the coin below, some major design elements you might enter in the search field are: “spear”, “shield”, “owl” and DOMIT (from the inscription behind the portrait). With these search terms the first thing likely to pop up is a coin of the Roman Emperor Domitian, who reigned from 81-96 CE. In this case it will be easy to determine that the denomination is a silver denarius. All three of these examples are fortunate and simple. However, even with the wonders of the Internet at our disposal, a great many ancient coins will be difficult to identify unless the researcher is quite familiar with ancient coins. Below are two examples. The first coin, an 80-drachmae of the famous Greek queen of Egypt, Cleopatra VII (51-30 B.C. ), is easily recognizable to the dedicated student. But if you don’t know where to start there is precious little to sink your teeth into. Inputting basic terms like “head” and “eagle” or “bird” will draw many thousands of hits on CoinArchives, and it would just would be a matter of luck if Cleopatra VII is among the first few hundred listings. The same may be said for the second coin, a sestertius of Didius Julianus, who held the title of Roman Emperor for slightly more than two months in 193 CE. Almost nothing of the inscriptions is present, and the reverse type, though relatively clear, is not distinctive enough to allow a specific search. 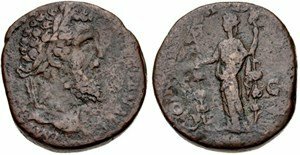 These especially difficult coins aside, CoinArchives is an outstanding, and now indispensable resource for those who want to research ancient coins. NGC is proud to have forged a relationship with A. J. Gatlin, founder of CoinArchives, which allows us to offer premium access to his database through our website. By going through NGC’s portal (as described above), visitors will have access to a larger and more varied selection of auction records. Those who want access to the full database, which includes auctions going back to 2002, must take out a subscription to CoinArchives Pro, a service introduced in the summer of 2009. Details of how to subscribe are available on the CoinArchives website. 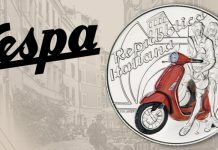 Any advanced collector or dealer will recognize that a CoinArchives Pro subscription is money well spent, for the amount saved (or made) even on a single coin due to a better-informed decision could greatly exceed the cost of an annual subscription. Images courtesy of Classical Numismatic Group, Inc.
Want to learn more about Ancient coins? 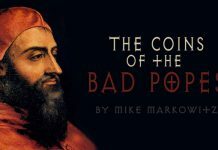 Check out Mike Markowitz and CoinWeek’s Ancient Coin Series here.